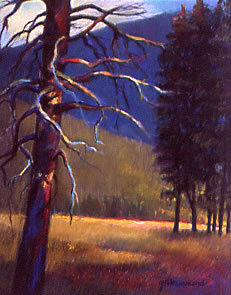 Margot Schulzkes name and her work are well known coast to coast. A contributing editor for The Pastel Journal, she is widely regarded as an authority on the subject of composition and design. Her upcoming book, A Painters Guide to Design and Composition (Northlight) will be out January 2006. The highly-regarded Pastel Society of the West Coast ranks her as a Distinguished Pastelist, an honor extended to only 26 of PSWCs approximately 4 members. Her work has been featured in a number of books and articles, a list of which appears below. 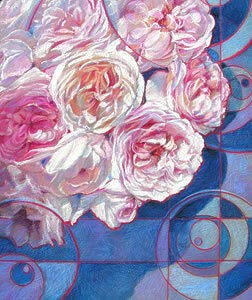 She has served as a juror for many exhibitions, such as Pastels USA (2003) and Pastels 100 (2004). At the turn of the millenium, an op-ed article appeared in a major newsmagazine, reporting that writer's search for the art medium of the 21st century. He outlined his reasons for rejecting watercolor and oil. He then offered a list of his requirements, in a medium he supposed had not yet been developed. Among them were permanence, convenience of use, and the capacity for exquisite control; he said this new medium would permit the artist to say exactly what he or she desired. As I read I told myself, he's talking about pastel. But he doesn't know it; he doesn't even mention it as a medium. Here we are, with permanence beyond any oil or watercolor painter's dreams, and as it turns out, beyond that of acrylics as well-which was once hyped as the great new medium of the 20th century. Convenience of use? He talked about the limits imposed by our new, higher-speed lifestyles, and that hobbyists had no time for washing brushes as in the past. Pastel has the convenience factor in spades. And sublime control? No medium can claim anything like the control possible with pastel. Pastel may be, and I believe it is, the great medium of the 21st century. We as pastelists have an opportunity to achieve not only widespread acceptance of the medium, but perhaps even its dominance of the art world. The question is, are we equal to the task? Are we adventurous and disciplined enough? Or are we going to bury the opportunity in an avalanche of inconsequential, pedestrian painting? While postmodernism is over-ripe and perhaps ready for the compost heap, we have observed here previously that the traditional art world, pastel included, has issues of its own that are, or should be, cause for embarrassment. Pastelists in the main are far too timid. We are, I believe, also too accepting of mediocrity. As we have observed before, the problem with what is hot is, like most marketing, it is-intentionally or otherwise-programmed obsolescence. What is hot eventually becomes what is not. Plagens asks the question about only one lion of the era. But the fact that it is being asked about one who was considered by many to be the most advanced of the abstract expressionists  raises the question around the circle. Such articles, questioning the validity of the art of the last half-century, are appearing with greater frequency. Change is in the wind; critics have realized a void exists where art used to be. However, the time to fill a void is before something else gets there. We can't do it by offering work that is less than excellent-as well as innovative. Cornpone bumpkinism? An offensive term, wouldn't you say? Unfortunately, we are often guilty as charged. Our exhibits are too often underwhelmingly safe-neither exploratory nor challenging. That is not to say there isn't excellent work included in such shows, valid on that ground alone; there simply is not enough exciting and interesting work. Chatham notes, art, like life, is best when it's allowed a certain unruliness, when it's not overly controlled, and certainly not when it's domesticated. Balance is the key, so long as the beam doesn't tip toward timidity, indecision and conservatism. And of course, so long as it doesn't tip too far in the other direction-toward chaos and nihilism. Somewhere between the extremes of cynical postmodern nihilism, and equally cynical, sweet commercialism is the authentic expression I attempted to describe in the last issue of the Pastel Journal. We don't need to be experimental to be authentic, to have something profound and honest to say. There is a vast range of great art that is classic, traditional and absolutely valid. It is good simply because it is good. Newness is definitely not the only criterion or the most important one. However, I submit that pastelists, as a group, have become too bound by rules. The work that is submitted to national and international shows seems more and more to be heavily weighted with safe art, work that is more likely to make it past the traditional juror than work that challenges the rules. The medium of pastel cannot afford to play it safe. We must not only allow experimentalism, we must encourage it, as part of the range of authentic art. The welcome mat must be out for those who effectively and knowingly break the rules. So Degas regularly sliced figures in half in his composition; would we then exclude him from competition? Modigliani distorted his figures; they were disproportionate: so throw him out? So did El Greco, if we go further back in time. Matisse played with perspective, while Salvador Dali played with our minds. And all of them to the great benefit of the visual arts. Now, about the question of balance. How do you tilt your lance at traditional concepts of art and still remain on the same side of the playing field? It is important that the intrinsic values of fine composition and drawing remain in place, or mostly so; it is learning how to bend them effectively, but not discard them, that allows the finest expression. I advise my students to come to know both drawing and composition backward and forward. Then if they choose to break the rules, they can do it with authority. It requires vastly more discipline and more guts to teeter along that balance beam, that precipice, than it does to parachute to either side. There are as many ways to go at this as there are artists who are dedicated to the task. 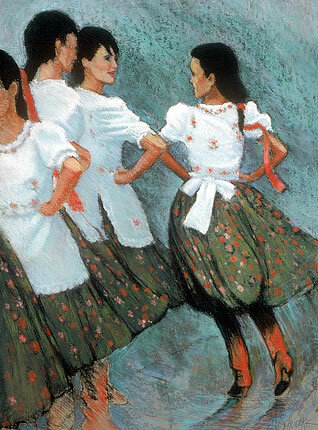 One can challenge the status quo in terms of subject matter, drawing and perspective (á la Matisse), technique (which the impressionists did and turned the art world on its head), and composition (which Degas also did, so effectively). Or one can retain whatever rules there may be and simply go for a greater intensity, a new viewpoint or perhaps eliminate modeling. The list of possibilities is endless. Didier Jaen (The Pomegranate and the Knife) engages in surrealism, I believe with more subtlety and elegance than Dali. A retired literature professor, Didier tends toward the introspective aspects of our existence. He has done a series called Mindscapes. An ordinary still-life becomes extraordinary, playing with your mind without rolling over your senses. This is fine work, worthy of national exposure. Yet Didier has told me he is reluctant to submit his surrealist works to pastel competitions. Joan Hammond's luscious little plein air landscape, Yosemite Tree, included in a recent international show, is an experiment in terms of color. She successfully pushes color to the brink, but not over the edge-as some color theorists seem to. Joan says, I am doing this for me. That defiant stance has bred a what the heck attitude, which in turn led her to an aha experience in terms of color application. It was a breakthrough for Joan. Maria Sylvester is known for doing conservative subject matter in a non-conservative way. Eleven years of experience in commercial art have finely honed her design eye. Maria's close-up-and-crop approach to floral subjects, such as Tulip Twist, with its startlingly simple background, is fresh, powerful and uncompromising. An unexpected viewpoint or angle on an architectural subject has long been one of my own hallmarks. However, Ex Cathedra, my interpretation of the interior of Wells Cathedral in England, represents a new turn in the road-at least for this artist. The somber grays of the interior buttressing of that magnificent cathedral play against the vibrance of stained glass windows in the background. The focal point is the contrast between the two disparate elements. Several different forms of exploration are represented here. Rising above mediocrity requires taking a risk. It requires a willingness to fall on one's face, if need be. Joan Hammond's who cares attitude is therefore helpful. Maria Sylvester's solid foundation in design is a sturdy launching pad from which to explore artistic space. And Didier Jaen's probing mind, leading him into paths only he can see, is a major asset in such a quest. Being content with the status quo, with coloring inside the lines, does not make great artists or great artistic movements. Ken Shulman, Profile, Art and Antiques, March 2002, p. 144. Newman was known for painting vertical stripes on a solid color field. He called them zipsand attributed profound meanings to them. Peter Plagens, Newsweek, April 22.2002, p. 66-67. Emphasis added.